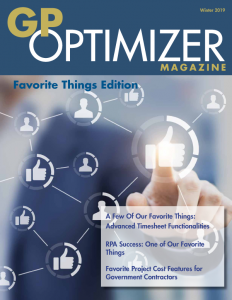 We are proud to announce that our very own Janice Phelps is featured in the Winter 2019 issue of GP Optimizer Magazine. Janice, having over 27 years of Dynamics GP experience, lends her valuable insight and expertise on container receiving and landed costs. Check out the full issue in the link below!